The Replace Color command in Photoshop Creative Suite 6 offers interesting creative effects by allowing you to switch one set of colors for another. It builds a mask, using colors you select, and then replaces the selected colors with others that you specify. You can adjust hue, saturation, and lightness of the masked colors. The Replace Color dialog box appears. Selection: Shows the mask in the Preview window. The masked area is black, semitransparent areas are shades of gray, and unmasked areas are white. Click the colors you want to select. You can click the colors in either the image itself or the Preview window. Shift-click or use the plus (+) Eyedropper tool to add more colors. Press the Alt key (Option key on the Mac) and click, or use the minus (–) Eyedropper tool and click, to remove colors. 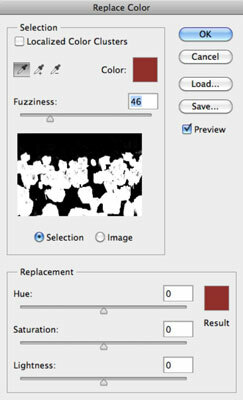 To add colors similar to the ones you select, use the Fuzziness slider to refine your selection, adding or subtracting from the selection based on the tolerance value. If your selection isn’t quite cooperating, try selecting the Localized Color Clusters option to assist you in obtaining a cleaner, more precise selection. The Localized Color Clusters option is especially handy if the color you’re trying to select is somewhat varied. Move the Hue, Saturation, and Lightness sliders to change them to new values. When you like the result, click OK to apply the settings.